The occupation of the Italian peninsula between 9 and 10 September on the part of the Wehrmacht represented a great opportunity for the latter to lay hands on millions of workers. About 800,000 servicemen ended up in the hands of the army, which transferred them to camps in Germany and Poland whilst deciding what to do with them. Moreover, during the first few weeks of the occupation, in the power vacuum left by the collapse of the Kingdom of Italy and the lack of a collaborationist government (Mussolini was in German hands in that country until 23 September), it was the Wehrmacht which was the de facto government in the occupied territory. In theory, on 10 September 1943 the German ambassador Rudolph Rahn had been entrusted with civil powers in Italy by means of an order emitted by the Führer. With this order the National Fascist Government (as the occupied territory was called at the time, given that there was in fact no real Italian government) was officially recognised by the Reich, thereby guaranteeing control over the new fascist state through the offices of the plenipotentiary in Italy, Rahn.1 Theoretically Rahn had the powers to govern Italy through the prefects, who would have had to carry out the instructions handed down via his subordinates. However Toussaint had no control over those territories which had been annexed “de facto” by the Reich, that is the “operational zones of the Pre-Alps and the Adriatic Littoral”, a group of provinces which on 11 September had been placed under the control of two Gauleiters (local fascist party chiefs), Franz Hofer and Friederich Rainer. Both the Italian authorities and military authorities were excluded from these two “operational zones”. Moreover, from 10 October 1943 onwards the provinces to the south of Rome were assigned to Field Marshal Albert Kesselring, the Supreme Commander of the Southern Front, who had the power to issue orders both in civil and military fields. In addition to the Wehrmacht and the Ministry of Foreign Affairs, all the other German political and economic institutions established themselves in Italy, for example there was a representative of the Goering's Four Year Plan, an envoy from Speer's Ministry of Arms and Munitions (hence the Todt) and an envoy from the organisation run by Sauckel, the “ Plenipotentiary for the workforce”. All three organisations were competing amongst themselves for the recruitment of forced labour. This multiplicity of organisations, apparently in contradiction amongst themselves, created a state of general chaos, thus adding to the total confusion which reigned during the weeks immediately following the occupation due to the absence of an Italian government and of institutions to which the Italian citizens could turn with certainty. Which orders, which laws and which institutions should they obey? Hence a military command had been put into operation by the Consulate General, a classic case of confusion between civil and military powers. In this very early period, however, it was the Wehrmacht which carried most weight where the exploitation of forced labour was concerned. In September the German strategy was to use those men who had been rounded up in the zones near to the front line to build the fortifications needed to stop the Allied advance. Moreover, it seemed to be easier to convince the workers to enrol, or at least not to go into hiding, if they were employed near to their own homes and at the end, bearing in mind the fact that the Wehrmacht had taken around 800,000 prisoners from the Italian military, transferring them to camps in Germany and Poland, these civilians were of more use in the Peninsula than in the Reich. Ultimately, it is also necessary to bear in mind that while the army had a massive presence in Italy, the other German agencies needed time to transfer their offices and representatives to Italy and to organise their networks south of the Alps. These round-ups in the city of Naples, as is well known, had an unexpected outcome. The extremely rough measures adopted by the Wehrmacht led to a general uprising in the city and forced the German troops to withdraw in haste. The city of Naples was not the only one to have been affected by roughly conducted round-ups during this early period of the occupation. On 22 September Kesselring ordered the evacuation of the western coastal strip between Naples and Leghorn for a distance of five kilometres inland. Moreover, the evacuees would also have been forced into building fortifications. On 4 October the XIV Panzerkorps ordered the evacuation of the area between the front line and five kilometres to the north of it, again with the same intention of using male evacuees to build fortifications. Numerous reports came in from the Italian authorities regarding the extremely rough methods used in carrying out these orders. For example, on 13 October 1943 the German unit based at Ariccia arrested an imprecise number of civilians, sending them firstly to the concentration camp at Bracciano and then to the one at Ostia. On 22 September the Prefect of Rome, Di Suni, announced the call-up for forced labour of all those youngsters aged between 18 and 21 years in the central Italian provinces. Payment was fixed at eight lire per day, with free board and lodgings. Other than their own pay, their family was to be 20 lire for their spouse, 10 lire for each parent for whom they were responsible and 5 lire for each child. Every worker had to report for duty with a blanket, a change of underwear, shoes, crockery and cutlery. Those who did not conform to regulations were to be punished according to what had been laid down in Royal Decree no. 1611, which dated back to 31 October 1942. The Italian ministry replied by means of a long report which explained why such a disappointing result had been obtained. “The announcement came too soon after the painful events which had taken place between 9 and 12 September and the consequent general disorientation brought about by the hasty dissolution of the Italian Army. In short, the Italian response to the Germans was to rebuke them, firstly for having created the chaos and having terrorised the population, and secondly for having requested that voluntary enrolment be organised by those Italian institutions from which they had taken away the means to carry out what had been asked of them. The result was that instead of the 60,000 labourers requested, 3,020 had enrolled voluntarily and 4,157 had been press-ganged by the Germans. These were obviously servicemen who had avoided the round-ups which had taken place immediately after the occupation at the instigation of the Wehrmacht, or were youngsters who had failed to respond to the call-up. Faced with such a humiliating failure, the German military decided to use force, and in Rome there were a number of indiscriminate round-ups (27 October 1943), which led to growing diffidence amongst the population as far as the Germans and their “brotherhood of workers” were concerned. In a letter dated 19 November addressed to the Italian Home Office by Colonel Seifahrt, chief administrator of the Southern High Command of the Wehrmacht, it was proposed that ration books should be taken away from those youngsters who were evading work. On 20 November General Francesco Paladino, who in the meantime had set up a General Labour Inspectorate about which more will be said later, went up to Gargnano for a personal meeting with Mussolini in the company of a “German General who is an expert on work service”, whose particulars are not known but who may have been Colonel Seifahrt himself. On 29 November a further meeting took place at the German Embassy in Rome. The military commander of the city of Rome Kurt Mälzer, Colonel Seifahrt and the German Consul Eitel Möllhause were all in attendance as were Coriolano Pagnozzi, Tullio Tamburini (Chief of Police), Colonel Bocca (General Secretary of the Armed Forces), the Prefect of Rome, Vittorio Rolandi Ricci and a colonel representing General Francesco Paladino. The Italian contingent was compelled to listen to a furious outburst from Möllhausen, who said that whilst the German soldiers were out there fighting the “Italian youth was literally doing nothing”. At that point Rolandi Ricci proposed to take away the ration books from those youngsters who had not responded to the labour call-up and also from their families. 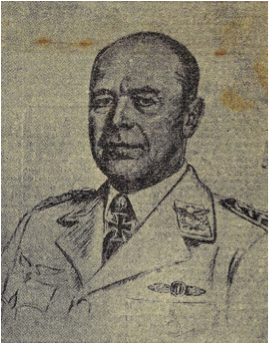 Möllhausen gave his approval to this proposal and on 1 December, in the Prefecture, there was a further meeting at which only the Italians were present. In this meeting it was decided that the taking away of ration books would apply only to the citizens of Rome. On 9 December a decree was passed stating that all Romans must report for forced labour, and failure to do so would result in the loss of their ration books. In the run-up to Christmas a register was started of men eligible for work and this new census was intended to be completed by 31 December.16 As is well known, this census di not produce the desired results. The attempt to convince the workers to enrol voluntarily ended in a fiasco. In Rome, out of the 100,000 unemployed, who according to the Fascist party lived in the capital and were in theory available for work, only one thousand turned up to enrol over the space of twelve days. Obviously this type of political initiative was ineffectual, and even if some Wehrmacht officials carried on rounding up men and forcing them to build fortifications, the higher German authorities realised fairly early on that it was necessary to use the remaining Italian authorities and the newborn republican fascism to recruit the workforce needed to sustain the war effort. On 1 October 1943 the plenipotentiary Rahn met Rommel and Toussaint on Lake Garda. 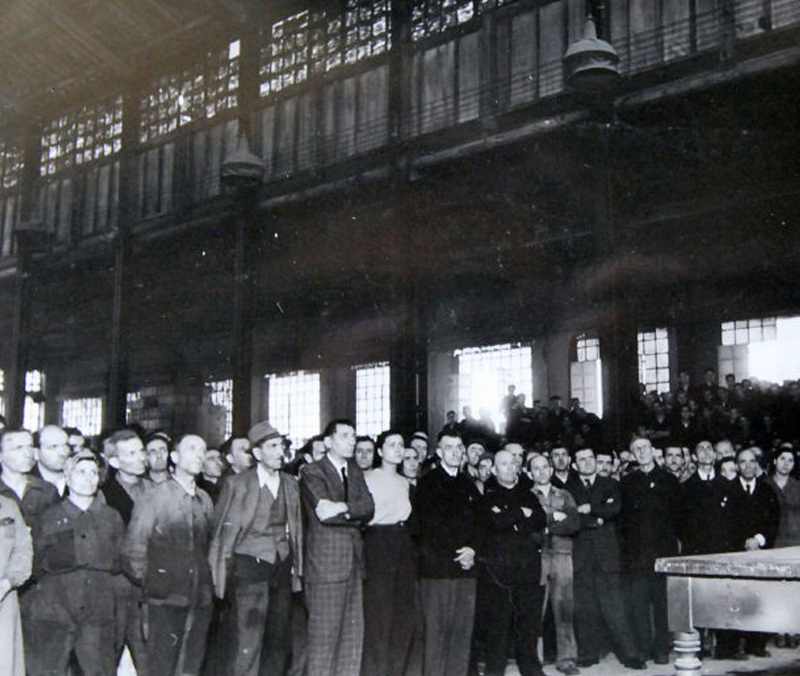 At this meeting it was decided to use the republican government to run civil affairs.19 In this framework the newly-constituted RSI (Repubblica Sociale Italiana - Italian Social Republic) would legalise the recruitment of workers, including forced labourers, in such a way as to reassure the workers themselves. At the same time, however, even the high-up fascist authorities realised that indiscriminate round-ups, forced labour and deportation to Germany would be a death blow to the prestige enjoyed by Fascism and the Republic. No one would have any confidence in a state which could not even guarantee minimum standards of personal security to its own citizens. Lutz Klinkhammer, L’occupazione tedesca in Italia, Bollati Boringhieri, Torino, 1997, pp.51-53. Lutz Klinkhammer, L’occupazione tedesca in Italia, Bollati Boringhieri, Torino, 1997, p. 62. 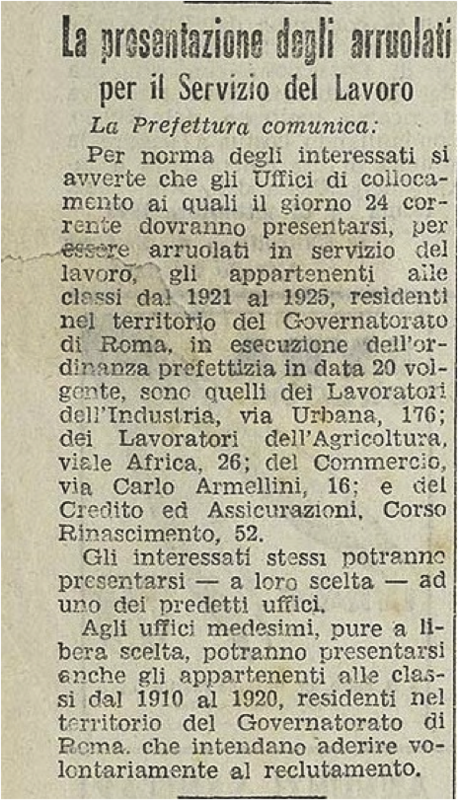 “Corriere della Sera”, 16 settembre 1943. Lutz Klinkhammer, L’occupazione tedesca in Italia, cit., p.131. Lutz Klinkhammer, L’occupazione tedesca in Italia, cit., p.132. Lutz Klinkhammer, L’occupazione tedesca in Italia, cit., p.136. Archivio Centrale dello Stato, Segreteria particolare del Capo della Polizia RSI, b.27. Lutz Klinkhammer, L’occupazione tedesca in Italia, cit., pp.138-139. “Il Messaggero”, 21 settembre 1943. Lutz Klinkhammer, L’occupazione tedesca in Italia, cit., p.146.